Weren’t able to make it to our AGM on March 28? That’s okay, we documented it! Please take a look at the minutes from the 2019 AGM. See the full Executive Board here. We hope to see many CUPE Local 2081 members at the Annual General Meeting 2019 on Thursday, March 28, from 5pm to 7:30pm in Young 216 (Gibson Auditorium), Lansdowne campus. Your union requires active participation within your executive, committees and delegates. Education and training are available; see CUPE Local 2081’s by-laws for more information. Please join us for a Special Membership Meeting! This is to replace the February 12 meeting that was cancelled due to weather conditions. It’s never too early to start planning for your retirement. Learn about government and workplace pensions and leave with some good tools to help you prepare financially and psychologically. Presented by CUPE BC. Participants MUST attend all days. 1) Seek approval from your supervisor. 2) CUPE 2081 Members: You will need to register with the CUPE National site at https://cupe.ca/mrm-union-education/event/2480 Email Shelley Butler at butler@camosun.ca to advise of your registration, and your department and supervisor’s name. We will need to know this information to request Union Leave for the Friday. Note: there is a maximum of 35 participants. Sign up early to ensure your seat. Thursday will be Employer-paid leave. Friday will be Union Leave (once your leave from work is approved and you have registered, CUPE 2081 will send the appropriate paperwork to your supervisor). Saturday will be your own time, provided you do not work on Saturdays. If you do work on Saturdays, vacation leave, banked overtime leave, or unpaid leave may be taken. 3) Refreshments and lunch will be provided on Thursday, Friday, and Saturday morning. We are unable to accommodate dietary restrictions. If you have any dietary restrictions, please bring your own food and/or drink. Please join us for a Special Membership Meeting! Other reports and documents will be available before the meeting. Please review the reports and documents prepared for the November 22 General Membership Meeting. Please join as at our October General Meeting! Pizza will be available! Please RSVP (cupe2081@camosun.ca) if you will be attending and at which campus. CUPE 2081 Executive encourages members to participate in Orange Shirt Day events at Camosun College on Friday, Sept 28, 2018. Orange Shirt Day is a way to show support for those who attended residential schools and their families. It is based on the idea that every child matters. Talk to your supervisor about taking time to attend one of the activities on Interurban and Lansdowne campuses. If you have your supervisor’s support, talk to your colleagues in your unit and invite them to join you. Watch CUPE BC members speak out on reconciliation. 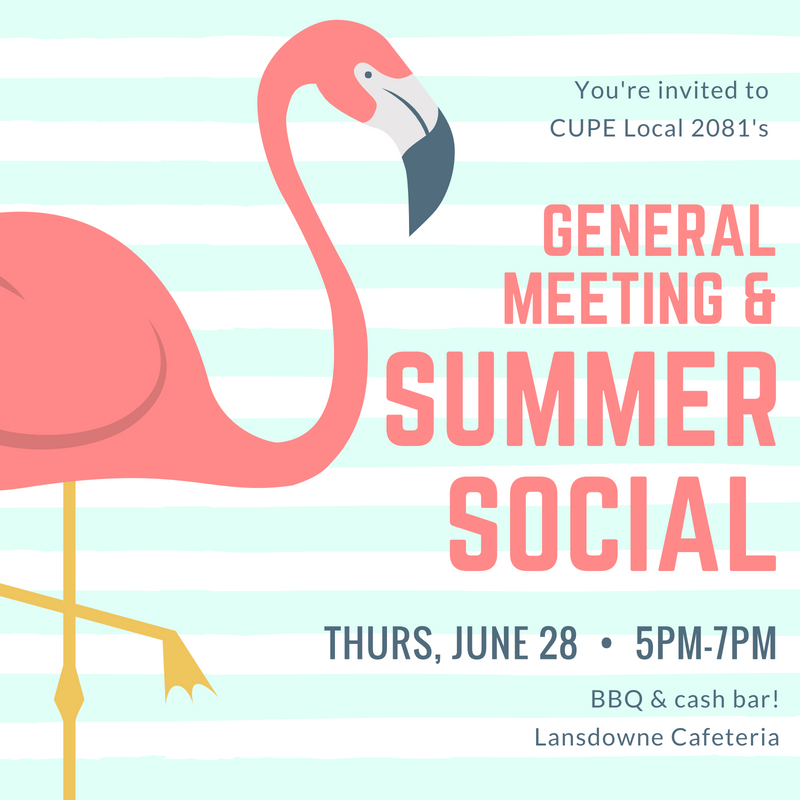 Please join CUPE Local 2081 Executive and members for the annual General Meeting & Summer Social on Thursday, June 28 at 5:00pm in the Lansdowne Cafeteria. Following a short membership meeting, a BBQ with accompanying salads and sweet treats will be available at no charge. Also, a cash bar (using debit or credit) will be available. Come on out for the opportunity to socialize with your fellow members! Tickets to the Greater Victoria Shakespeare Festival will be handed out, too.